POLYSTYRENE FROM A marina destroyed in Holyhead, Wales, has been washing up in Greystones Co Wicklow. During Storm Emma, pontoons made from polystyrene were destroyed at the Holyhead marina, the Welsh newspaper the Daily Post reports. Since the extreme weather event, the material has been washing up on beaches in Greystones. The Daily Post reports that up to 80 boats were smashed in Holyhead in gale-force winds, and that clean-up operations had recovered 30 tonnes of polystyrene so far. But some of that polystyrene has been breaking up and floating as far as Wicklow, where locals have been spotting it on beaches. 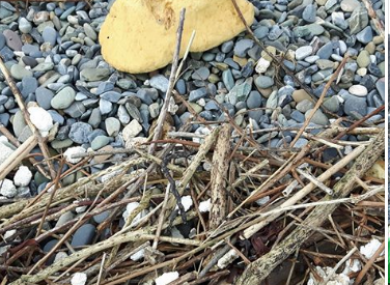 Over in Greystones, the local Tidy Towns committee had been removing the polystyrene – which has been breaking into small pieces – from the shoreline, without knowing its source. Polystyrene has been spotted on both the north beach and south beach, said McCooey. The source of the polystyrene was a surprise to her. “This is the first time I’ve heard anything about it coming out from Holyhead. We had no idea where it was coming from. We were saying to ourselves where on earth is the polystyrene coming from?” They thought the source could have been building sites or boats. Polystyrene is a synthetic product that is very slow to biodegrade. It is only accepted by some recycling companies in Ireland. Somewhat ironically, Holyhead is twinned with Greystones, and a local Holyhead group visited the Wicklow town for St Patrick’s Day. The leader of the Holyhead Sea Cadets told the Daily Post that they were embarrassed to see the polystyrene there during their trip. The Greystones Tidy Towns will hold a beach clean this weekend involving local Transition Year students. Greystones Councillor Derek Mitchell told TheJournal.ie that “there are bits of the expanded polystyrene that have blown up along the shore… blown over a very wide area”. He said he expects more of the polystyrene to come ashore in the coming weeks. The Greystones marina doesn’t use polystyrene pontoons like those that broke up in Holyhead. Email “Storm Emma brings polystyrene from Holyhead marina to Greystones beaches ”. Feedback on “Storm Emma brings polystyrene from Holyhead marina to Greystones beaches ”.